One of the things I like about my job is that every day is different. And, lately, there is so much going on that the days fly by… and shazaam, it is blog day again. This past week was just booming. 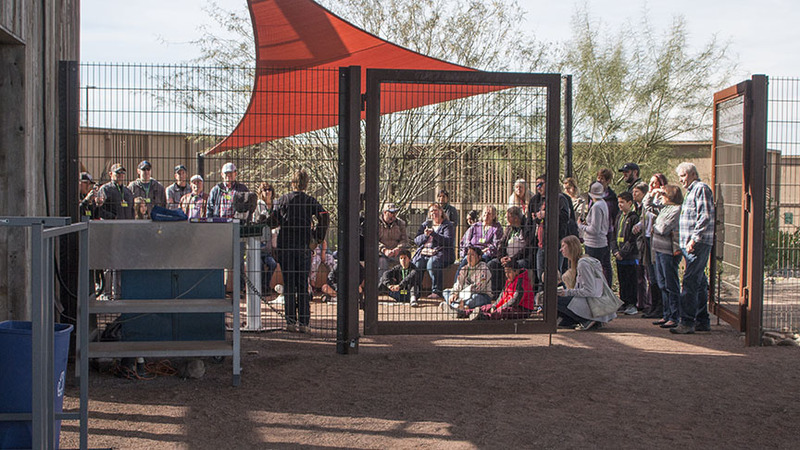 There are field trips often on Tuesdays and Thursdays with both kids and adults taking in the activities and programs. It is always fun for them and fun for us. 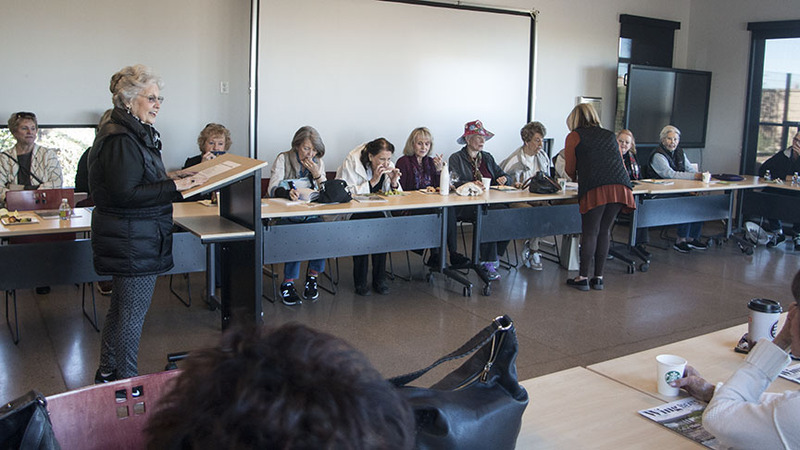 Our Wednesday open hours had to compete this week with the Diggers Garden Club who rented our large classroom for their monthly meeting. 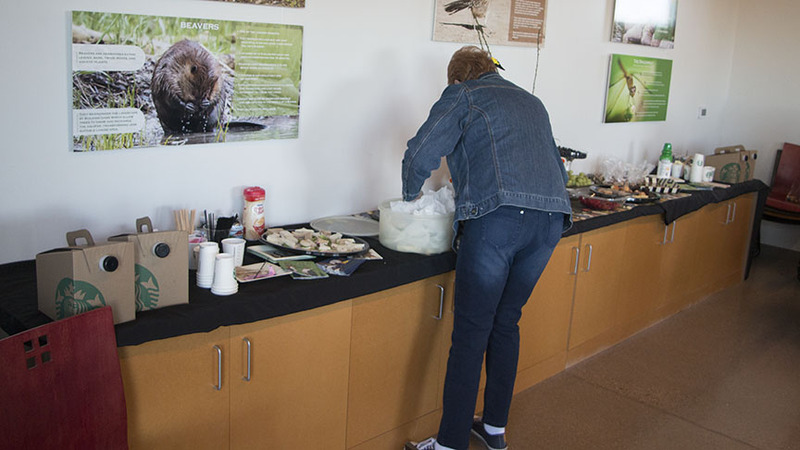 Despite the blustery wind, they were introduced to the hospital activities, toured the feather repository, watch the eagle feeding and the raptor program, and experienced the fun “walk of the ducks.” They even managed a meeting and brunch in between things. It was a delight to introduce them to Liberty Wildlife. We heard the common refrain, “I had no idea you did so much at Liberty Wildlife!” Well, and yes we do! Adding to that there was a tour for a potential board member… and I got to show off our work again! But, there was more. 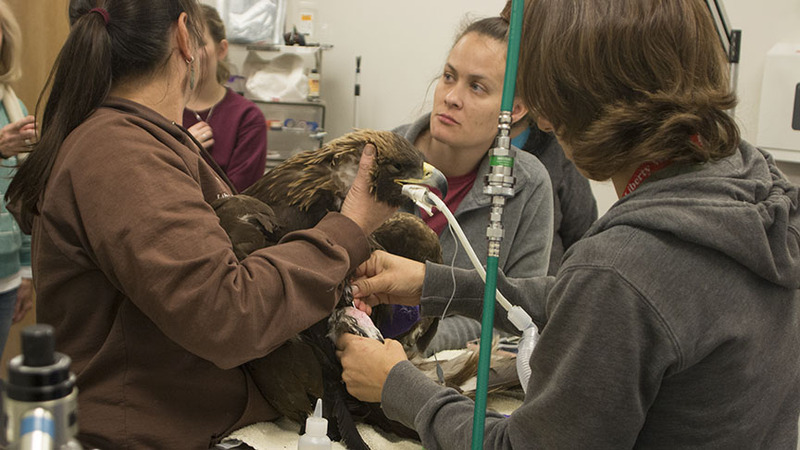 This week we were visited by the team from Purdue University who is studying the visual acuity and hearing of eagles. 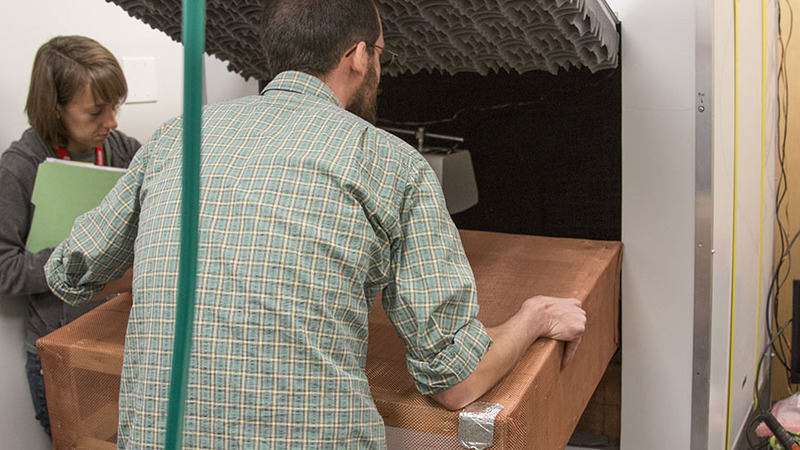 The study is designed to find visual or auditory deterrents for wind turbines. 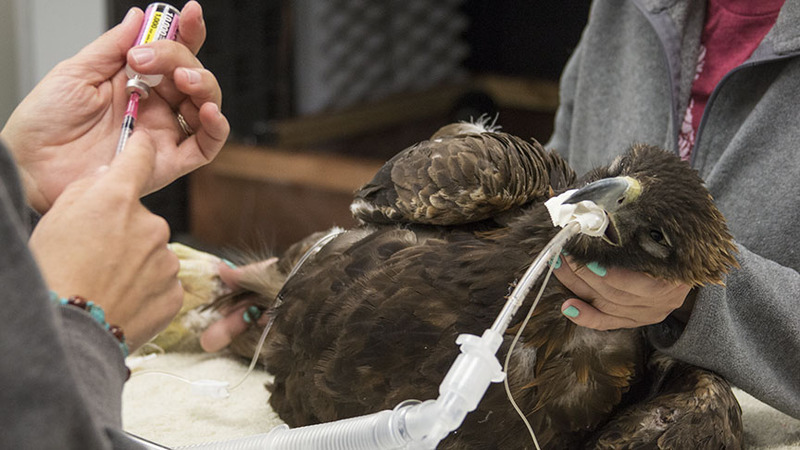 The thought being that if the scientists can find a visual or audio add-on to the wind turbines, then large birds of prey, like eagles, will learn to avoid them and reduce the number of wildlife injuries. 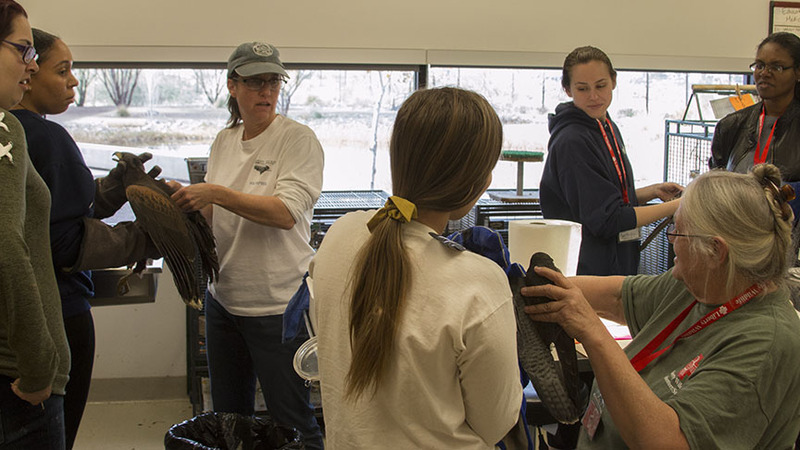 The Purdue crew worked for a couple of days using eagles in our rehabilitation facility as subjects, and I will hasten to say it was very gentle and respectful of each subject and everyone went away happy. 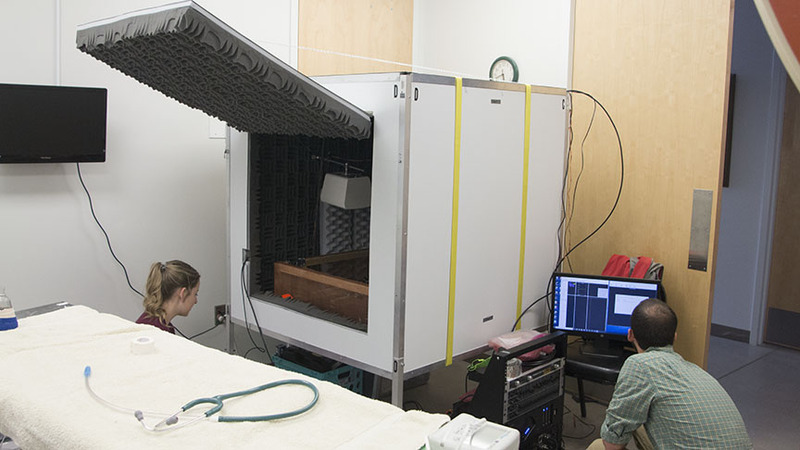 This is one of the often unnoticed benefits of the rehabilitation process. 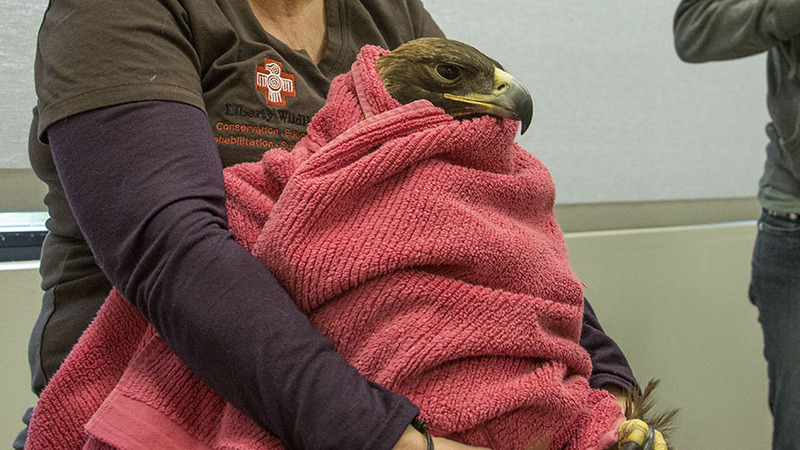 No wild eagles had to be trapped for the study. And the knowledge gained will help the species down the road. A win-win for all concerned. On Sunday, I arrived to see banners up the front walkway announcing the Sustainability Solutions Festival that was being held on campus with free attendance to all who joined us. It was very fun and informative. There was an SRP booth and display from the sustainability group, a bee and pollinator booth, a skull display from the Science Center, a sustainable cities interactive display, and booty from each participant group. I was so impressed with the material presented. It was fun, informative, and among other things, I picked up a packet of potentially yummy recipes. 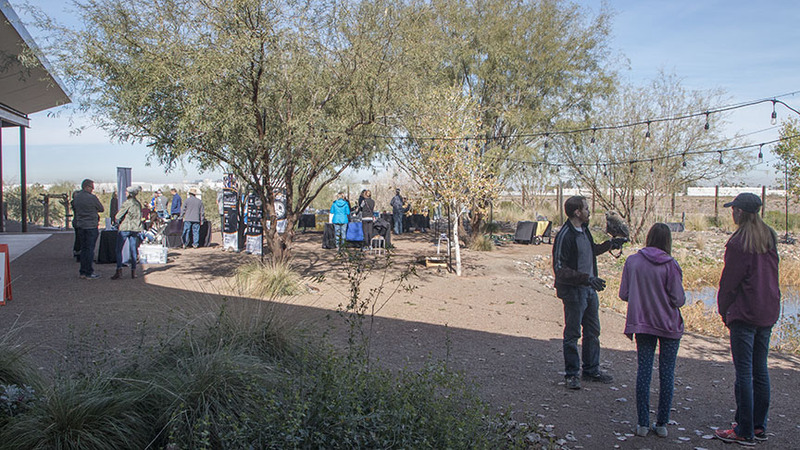 A huge thanks goes out to everyone presenting and especially to the Rob and Melani Walton School of Sustainable Solutions at ASU for the success of the event. It moves around the Valley, and if you haven’t seen it yet, keep an eye out for it somewhere near you. You won’t be sorry that you attended. Another reminder.. check out our Facebook page and our on line events calendar. We have a lot going on. Sign up today for our Sippin’ the Spirit of the Southwest event on February 24th… it should be a lot of fun! The intake total for the year is now up to 313. 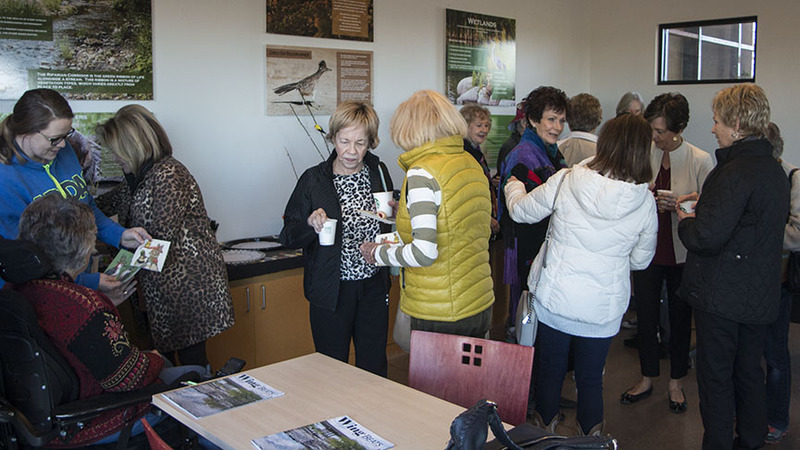 We recently hosted a meeting of the Diggers Garden club at Liberty Wildlife. These ladies, dedicated to beautifying the world around us, arrived on a cool morning and seemed to truly enjoy the warm hospitality and wonderful facility we provide. Our large meeting/classroom provides a memorable venue in a unique setting for groups such as this. Near the top of the list of assets our new home offers is the group of marvelous volunteers we have available. 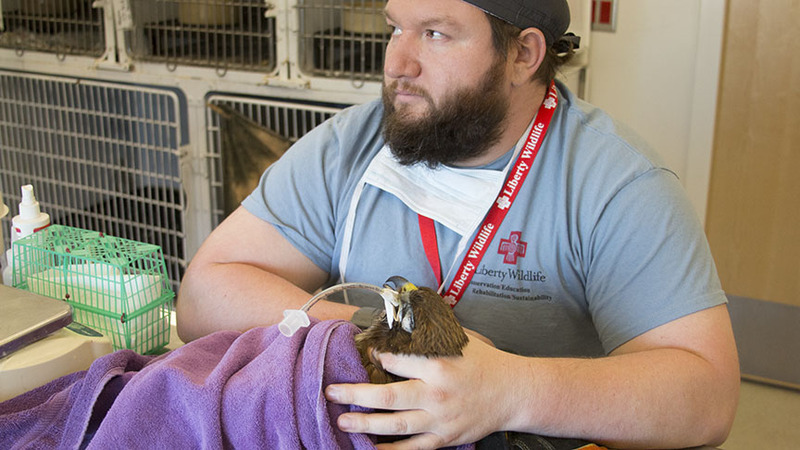 On a recent Tuesday, we had three outstanding veterinarians on hand to provide the finest medical care possible for the animals we have as patients. Drs. 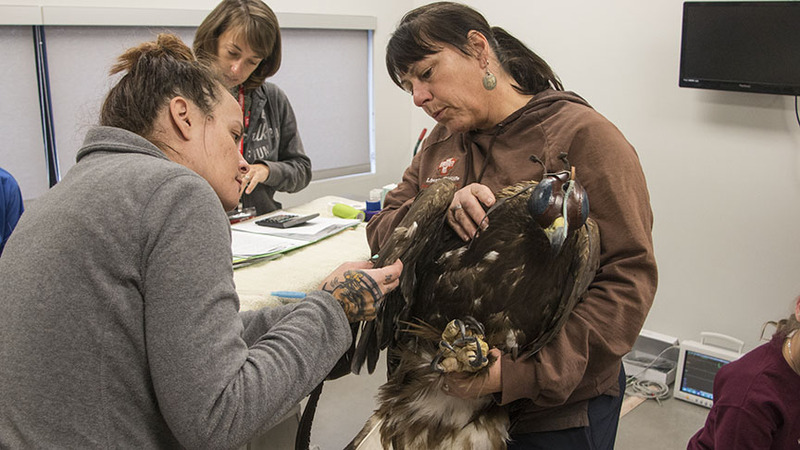 Orr, Wyman, and Semick were in attendance, all working together in the Triage room checking birds that had been admitted recently and updating their treatment. These included a peregrine falcon, a couple of red tailed hawks, and some Harris’ hawks. 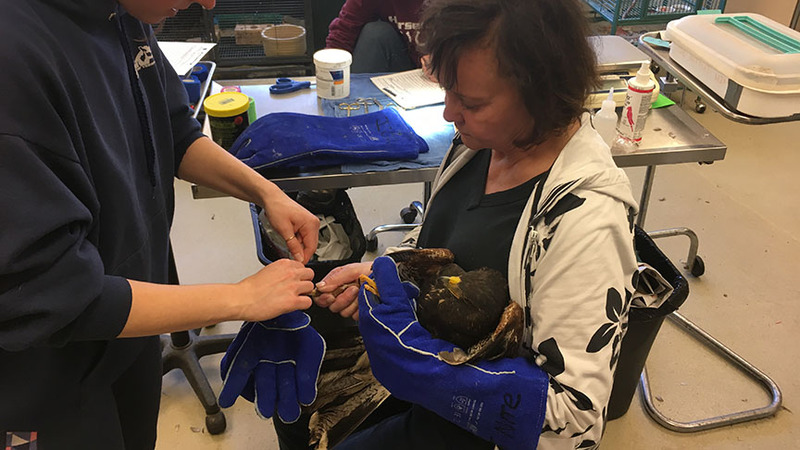 One of the Harris’ hawks in our care had a fractured femur which, due to it’s position in the leg, made it a good candidate for pinning surgery. 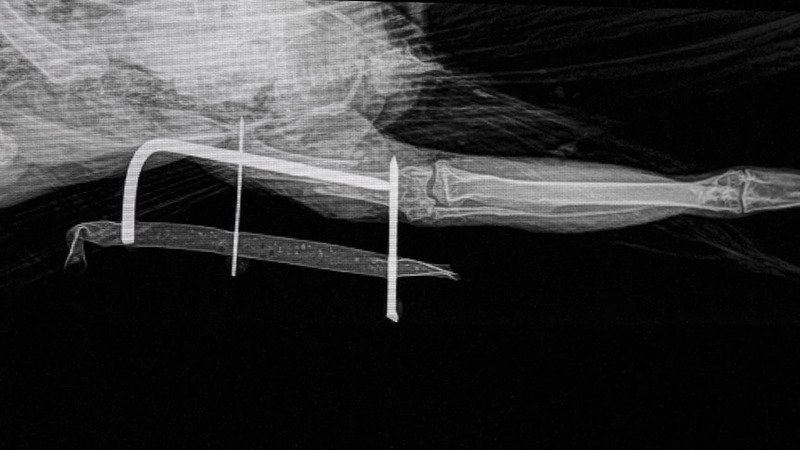 Dr. Scagnelli performed the surgery installing a pin with an external fixator to hold the fractured bone ends in alignment as they heal. The operation was performed in our own surgery room and by all indications, it had a very successful outcome. 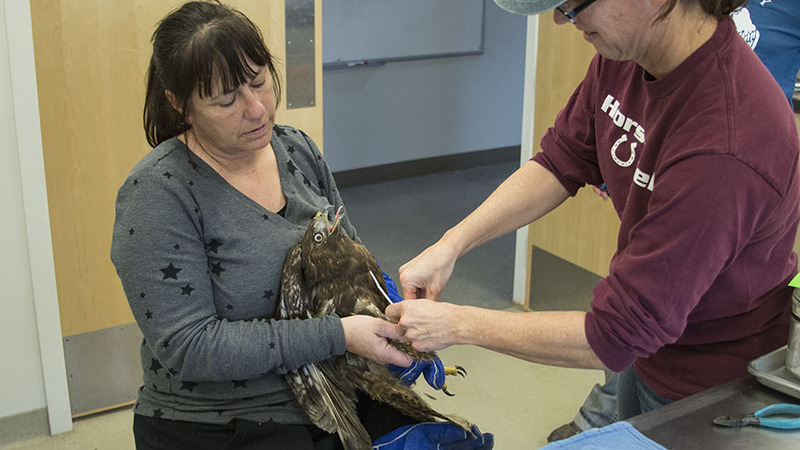 Hopefully this hawk will eventually be released to live in the wild as it was designed. 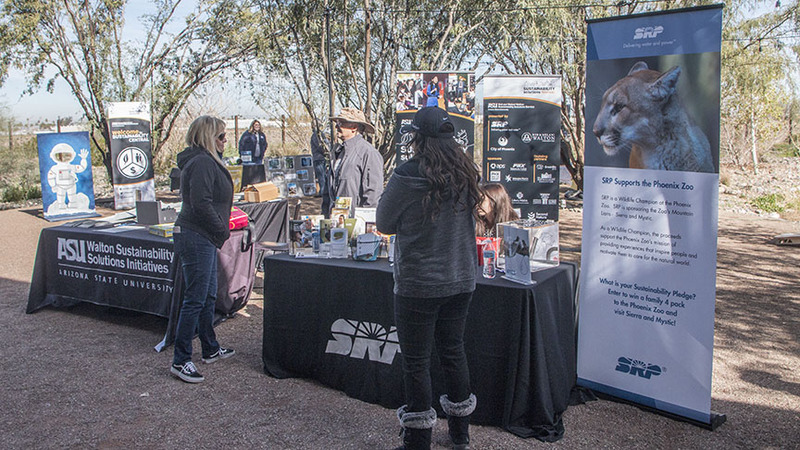 Last week we hosted the “Wild About Sustainability Day” as part of the Sustainability Solutions Festival put on by the Rob and Melani Walton Sustainability Solutions Service at ASU. 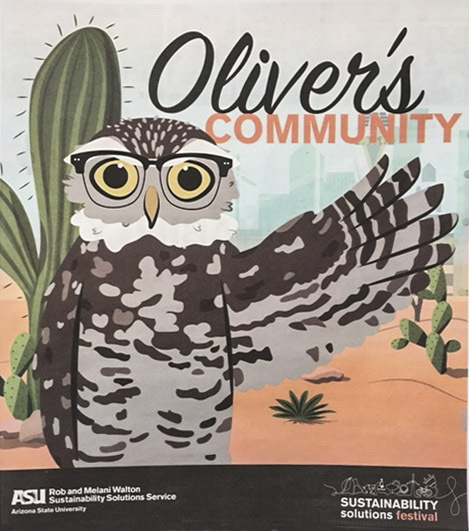 Along with partners SRP and Liberty Wildlife, this team came to our facility and set up various displays and booths introducing the public to “Oliver,” a burrowing owl with red sneakers, who teaches kids (and adults! )about things that promote sustainability. These include adaptive reuse, green roofs, bee houses and other pollinator habitats. This event was well attended and well received. We take in orphans by the hundreds each spring, mostly birds – hawks, owls, doves, sparrows, etc. We also get in baby cotton tail rabbits and the occasional squirrel or other rodent. 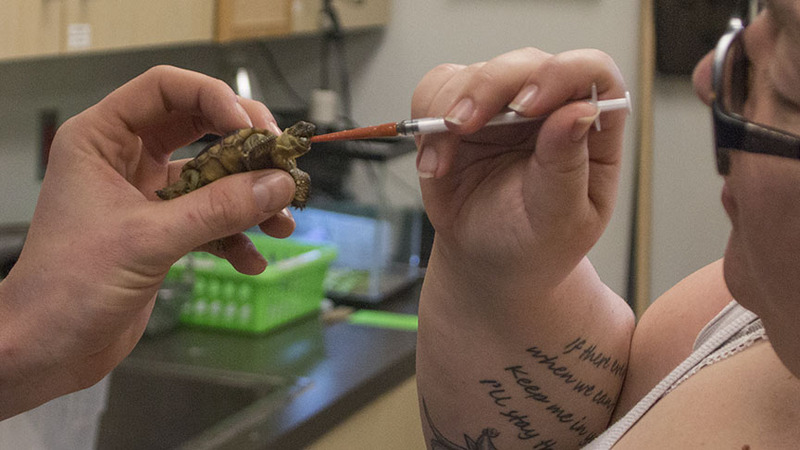 Recently we took in a baby desert tortoise which is not a unique occurrence, but it does sometimes present a challenge with respect to treatment as we don’t get a lot of practice with tiny baby reptiles. This little guy at least cooperated by “gaping” for his medicine! 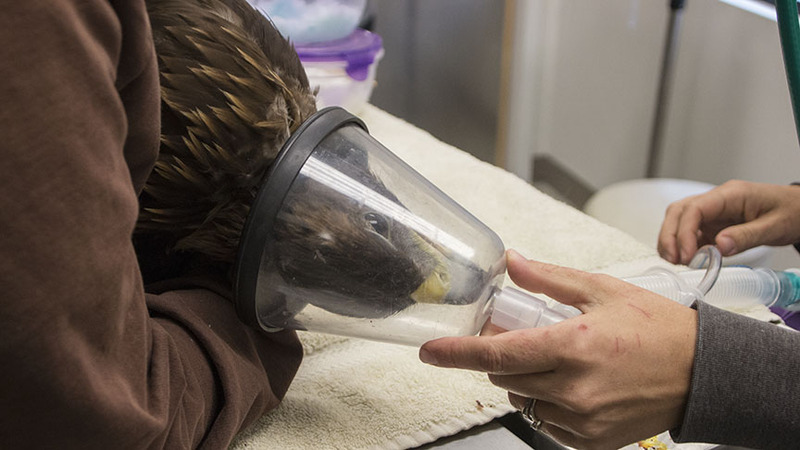 One of the unfortunate byproducts of wind power generation is the adverse impact of huge spinning turbine blades on birds, specifically golden eagles. Many of these wind farms are on open plains which happen to be the preferred habitat of prairie dogs, one of the main prey for golden eagles. 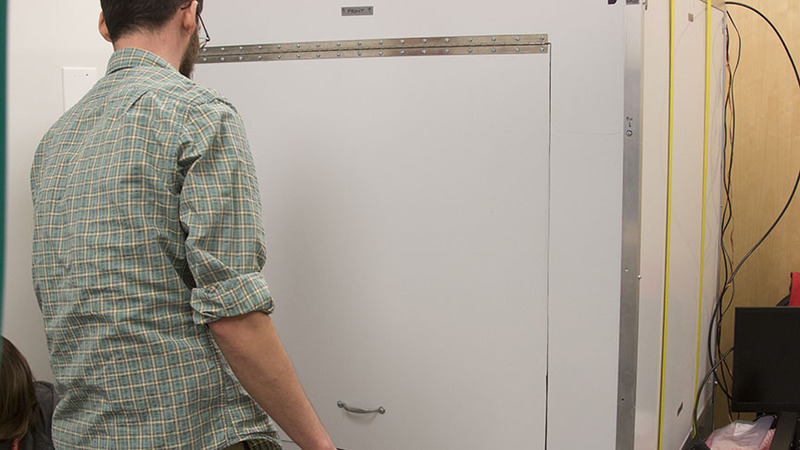 One of the largest operators of this type of facility is Avangrid. 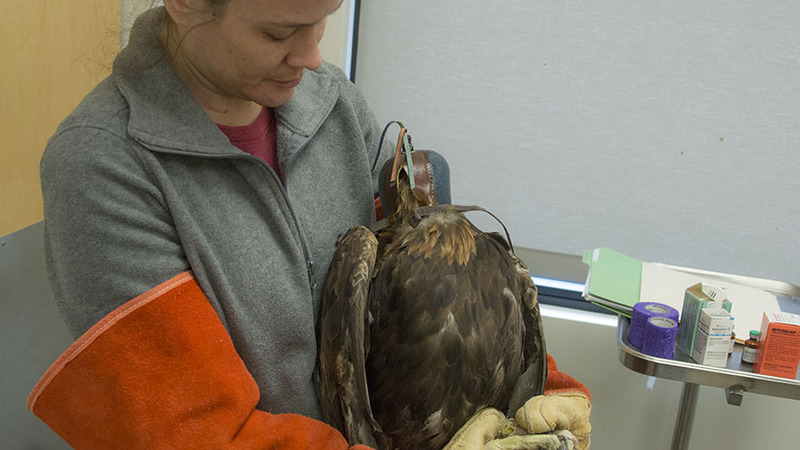 They are working with Purdue University to study both the hearing and eyesight of golden eagles to find some means of mitigating the disastrous interaction between eagles and wind turbines. 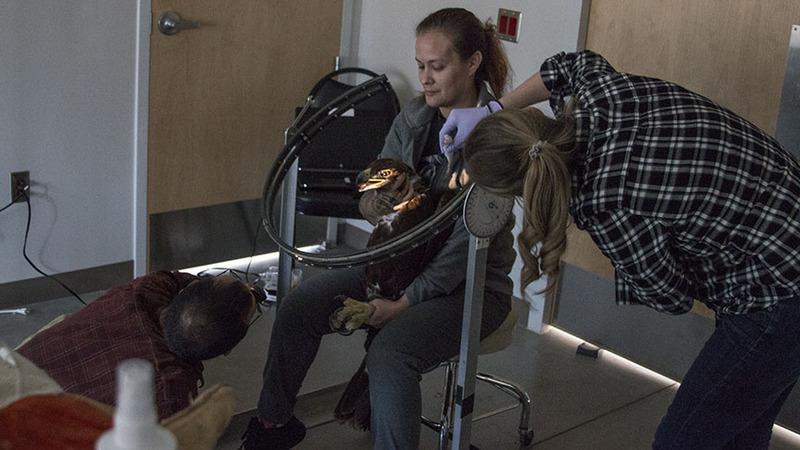 To this end, Benny (post-doctoral) and Nadia (Master’s candidate) drove from Indiana to Liberty Wildlife to study three golden eagles in our care. 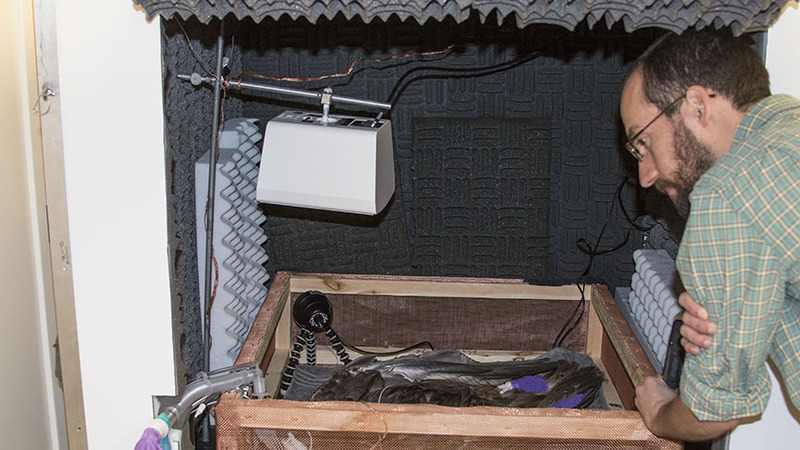 On the first day, each bird in turn was sedated to a twilight state, carefully monitored, and placed in a specially designed anechoic chamber assembled in our surgical room. 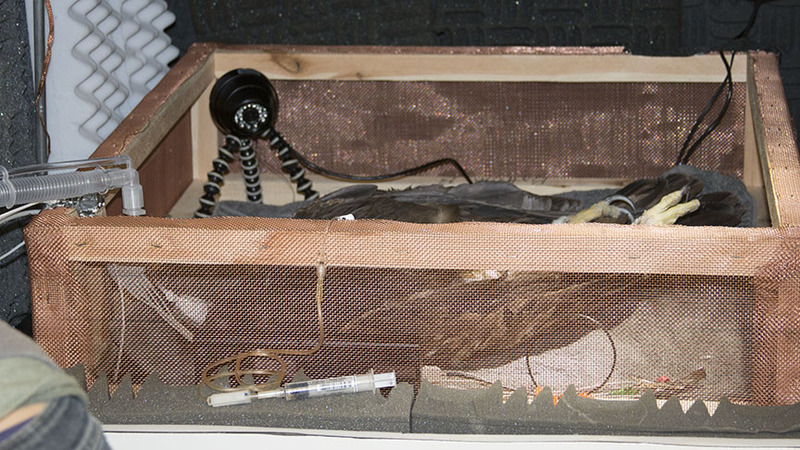 Different sounds and ambient background noise were generated as the birds were observed with both cameras and an array of sensors to record their reaction to the various vibrations. 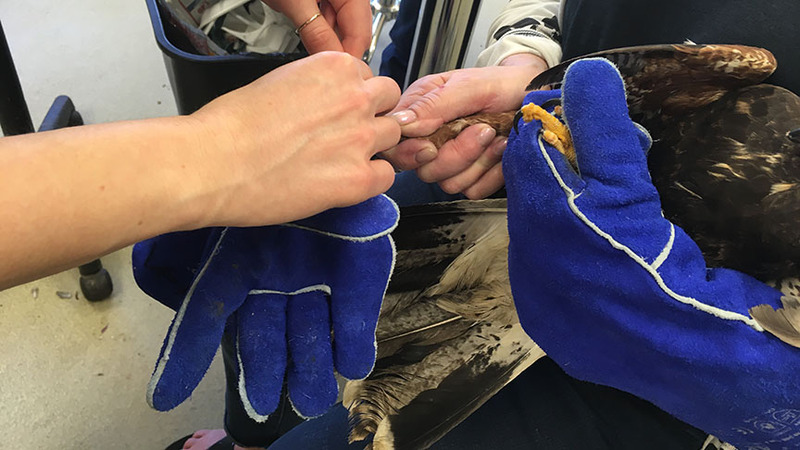 Great care was taken prior to each test and three veterinarians were in attendance to ensure the birds’ safety. 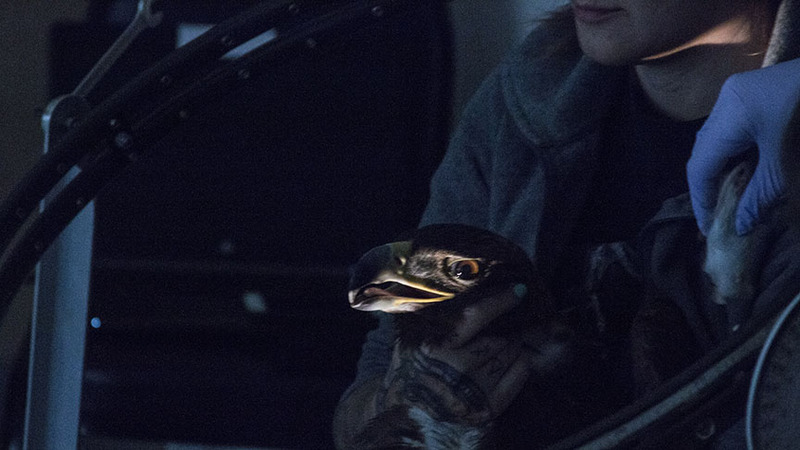 The second day, each bird was held in reduced light as their peripheral vision was checked, evaluated, and recorded by Benny and Nadia. 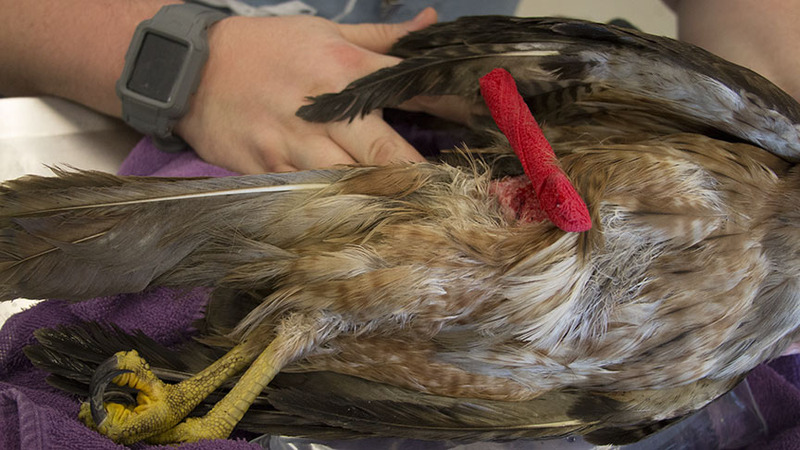 When all testing was complete, none of the birds presented any ill effects from the trials. 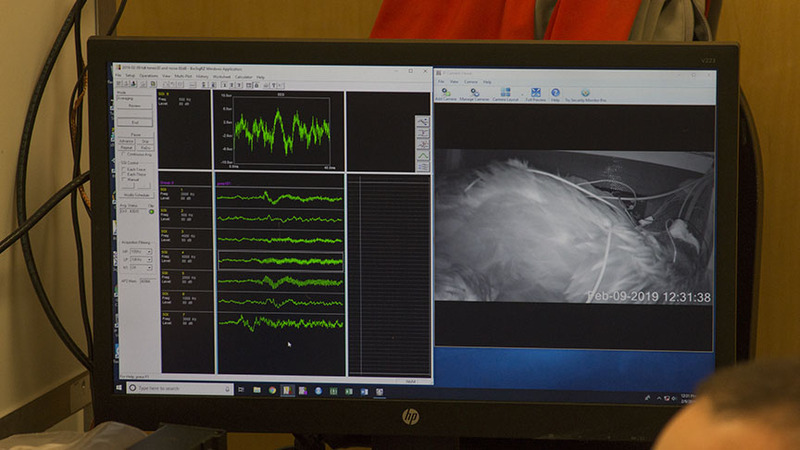 It is hoped that by these kinds of studies, a safer environment can be designed to support this renewable energy source so vital to the planet. 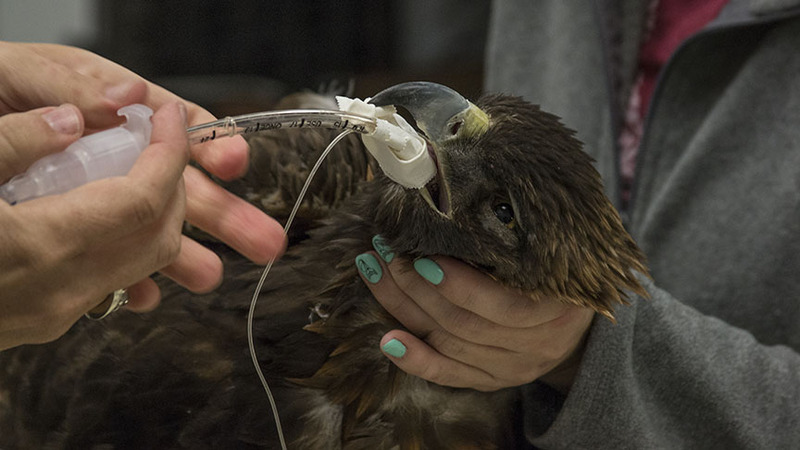 How exciting that Liberty Wildlife participated in the Purdue study. More and more wind turbines are being installed along golden eagle migration flyways. 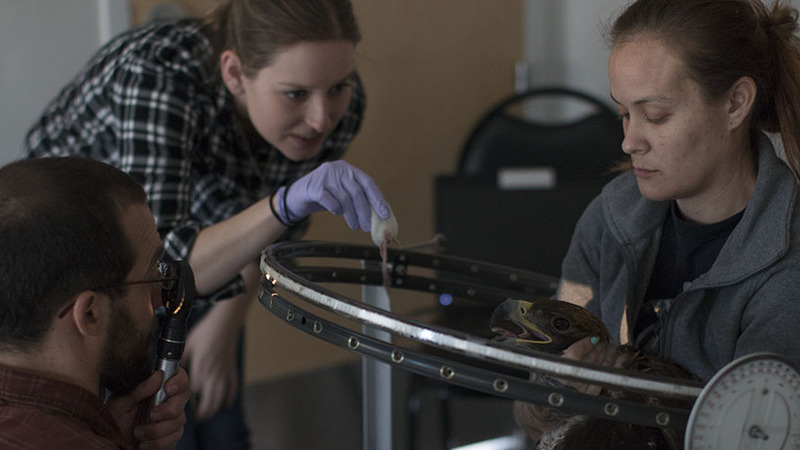 it is our responsibility to make sure migrating birds are as safe as possible while we search for successful ways to take advantage of cleaner power sources. 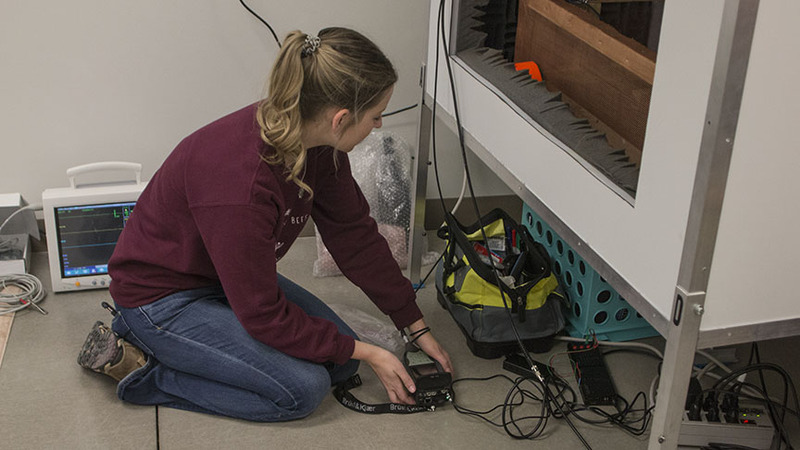 Thank you for including us in your study, Purdue! a part of all of this. Thank You for the opportunity!